The Dow Jones Industrial Average is down following sell-offs around the world and some worse-than-expected U.S. economic reports. As of 1:25 p.m. EDT the Dow is down 161 points, or 1.06%, to 15,017. The S&P 500 is down 1.03% to 1,615. Besides the productivity report, the rest of today's economic releases came in below economist expectations, pulling Dow stocks down. 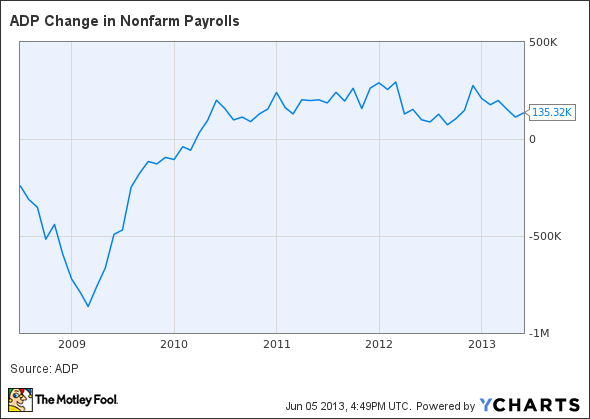 The key report here is ADP's private-sector employment report. Analysts had expected the payroll provider to report that the private sector had created 170,000 jobs in May. The actual gain was far smaller at just 135,000 new private-sector jobs. The government reports its official jobs report on Friday which analysts expect will show a gain of 175,000 jobs, slightly higher than April's 165,000 new jobs. As 70% of the U.S. economy is based on consumer spending jobs are an important barometer to watch for the health or weakness of the economy. Today's Dow leader is Cisco , up 0.7% to $24.52. Cisco is gaining alongside competitor Juniper Networks after Juniper's CEO said he sees a trend of rising spending in the sector. Cisco was the third-biggest Dow gainer last week and the second-biggest Dow gainer in May. The stock has been on a tear since beating earnings estimates last month, rising nearly 16% since it reported on May 16. Since then Cisco has announced a small bolt-on acquisition. Cisco has followed in the footsteps ofIntel by becoming a dividend powerhouse, having first initiated a dividend in 2011. The company has raised the dividend more than 200%. On Monday Cisco announced that it would pay its quarterly dividend of $0.17 on July 24 to shareholders on record as of July 3 for a current forward yield of 2.8%. Once a highflying tech darling, Cisco is now on the radar of value-oriented dividend lovers. Get the lowdown on the routing juggernaut in The Motley Fool's premium report. Click here now to get started. The article The Only Dow Stock Defying Today's Plunge originally appeared on Fool.com. Dan Dzombak can be found on Twitter @DanDzombak or on his Facebook page, DanDzombak. He owns shares of Cisco Systems. The Motley Fool recommends Cisco Systems. Try any of our Foolish newsletter services free for 30 days. We Fools may not all hold the same opinions, but we all believe that considering a diverse range of insights makes us better investors. The Motley Fool has a disclosure policy.